To Marina on the "Ships starting with M" page. The Australian War Memorial also has a picture of this ship, taken in 1941 (both links are external). This message in my Guestbook provides an external link to a picture of her as Rio Besaya (probably post war?). If my Spanish does not fail me, it gives the additional information that she was scrapped in Italy in 1960. Built by Deutsche Werft A/G, Betrieb Finkenwärder, Hamburg, Germany in 1935. Errors may exist, and the record is incomplete. 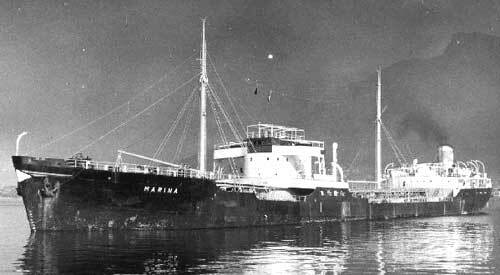 Marina is also listed in Convoy OC 9. According to Page 2, she left Melbourne on July 7 and arrived Sydney on July 10. Aug. 17 Sydney, N.S.W.   CO 19 Dispersed Aug. 20. She later appears in Convoy PB 12, departing Bandar Abbas Nov. 16, arriving Bombay Nov. 22 - Marina, however, was bound for Fremantle, where she arrived Dec. 10 (Page 2). Marina is subsequently included in Convoy DN 17 from Durban - She arrived Lourenco Marques Febr. 14, heading back to Durban Febr. 27. See Page 3. She now shows up in Convoy PB 36 from Bandar Abbas on Apr. 16, arriving Bombay Apr. 22 - again, see also Page 3. *Page 3 gives arrival Cochin Apr. 27. She's also listed in Convoy PA 66 from Bandar Abbas on Jan. 14-1944. According to A. Hague, she was detached on Jan. 16 and arrived Fremantle Febr. 6. Page 3 says she arrived Albany Febr. 7. See also Convoy GUS 78 and compare with Page 4 - Convoy left Oran March 18-1945, arrived Hampton Roads Apr. 4. From Page 1 of the archive documents, we learn that she was on her way from Los Angeles to Hong Kong when war broke out in Norway on Apr. 9-1940. Some of her 1941 voyages are also shown on this document and continue on Page 2, which also lists her 1942 voyages. 1943 and most of her 1944 voyages can be found on Page 3, while Page 4 has her 1945 and some early 1946 voyages. It'll be noticed that she sometimes had long stays in port, with a particularly long stay in Los Angeles at the end of 1943 (Page 3). She had arrived there from Devonport, Tas. on Aug. 12 and departure is given as Oct. 31, when she proceeded to Hobart (Page 3 shows another long stay at Brisbane in the fall of 1944). In Convoy C 12: Solør and Strix. In Convoy PB 12 - Beau, Britannia, Hilda Knudsen, Jotunfjell and Kongsdal. In Convoy PA 21: Strix (bound for Capetown). In Convoy DN 17 - Cypria. In Convoy DN 25: Kronviken and Olaf Bergh. In Convoy PB 36 - Alcides, Høegh Silverstar, Minerva and Norfjell. In Convoy BM 51: Norfjell. In Convoy PA 66 - Athos, Høegh Scout, Norfold, Polartank, Salamis and Strix. In Convoy GUS 78 - Norholm and Nueva Granada. Marina lost a crew member in May-1945 - see the text at the external link below. Stavern Memorial commemoration - This man, Gullik Marthinius Gulliksen was a gunner, cause of death or date not given, but the date Dec. 2-1941 is mentioned under the heading "wrecked" - this in some cases also refers to the date of death at this website. However, checking with "Våre falne", a series of 4 books naming Norwegian WW II casualties, I find that he died at a hospital in Auckland, New Zealand on May 19-1945, having previously taken ill in Dec.-1944, and is buried there. He may have been serving on Marina when he became ill - from Page 4, we learn that she had arrived Auckland (from Talara) on Dec. 28-1944. The date Dec. 2-1941 actually goes back to the sinking of D/S Fjord, on which he served at the time of her loss, but survived. Back to Marina on the "Ships starting with M" page.